34M with a history of HTN, polysubstance abuse, presenting with muscle cramps. He reported onset of diffuse muscle cramping 1-hour prior to presentation while showering. Symptoms involved bilateral upper and lower extremities and resolved spontaneously. On initial evaluation, the patient was tachycardic and hypertensive. Examination was notable for tremors in bilateral upper extremities with outstretched hands, as well as of extended tongue. Other notable findings included spasm of the upper extremity during blood pressure measurement, hyperreflexia and clonus. Laboratory evaluation was notable for normal total calcium level, low ionized calcium level, primary respiratory alkalosis, and elevated anion gap metabolic acidosis. The patient was treated with intravenous fluids, benzodiazepines for alcohol withdrawal, and calcium gluconate 4g IV and was admitted. Calcium gluconate 1-2g IV in 50mL of D5W over 10-20min followed by slow infusion of additional 2g over 2 hours. Cooper MS, Gittoes NJL. 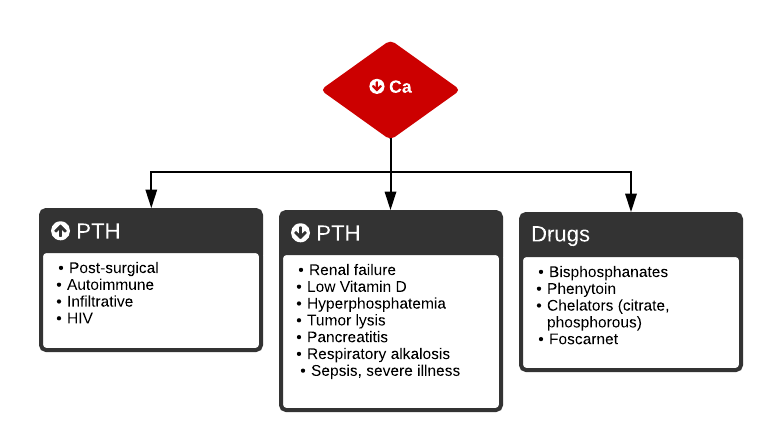 Diagnosis and management of hypocalcaemia. BMJ. 2008;336(7656):1298-1302. doi:10.1136/bmj.39582.589433.BE. Hannan FM, Thakker RV. Investigating hypocalcaemia. BMJ. 2013;346(may09 1):f2213-f2213. doi:10.1136/bmj.f2213.